Commenting on the book of Daniel, Theodoret, bishop of Cyrus (423-457 A.D.), clearly interpreted the "abomination of desolation" mentioned in Daniel's prophecy as foreshadowing a future, first century fulfillment of the "abomination of desolation" mentioned by Jesus in Matthew 24:15. This, of course, is another example of what I've been showing throughout this series: the early Christian Church saw Jesus clearly prophesying about the Jewish wars and the factions which resulted in the destruction of Jerusalem in 70 A.D.
2. Ibid. p. 203. 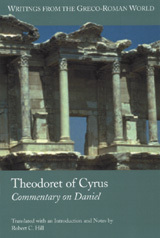 Theodoret of Cyrus, Commentary on the Twelve Prophets. On Zech. 14:4. "What you are saying is obvious"